Why Orangutan Foundation needs your support, more than ever. Detected and prevented illegal activities within two protected areas, home to thousands of Bornean orangutans and many other critically endangered or threatened species. Prevented the spread of fires to the Lamandau Wildllife Reserve, home to an estimated 500 Bornean orangutans. Nurtured tens of thousands of tree saplings and planted in degraded forest areas of Tanjung Puting National Park and the Lamandau Wildlife Reserve. Engaged with the Indonesian government and companies to implement best forest management in unprotected orangutan habitat. We do all this so that wild orangutans, like the one below, stay wild. We need your help to continue doing this. If you haven’t already, please consider setting up a regular donation click here to support our vital work. Please also help by sharing this blog post. From Orangutan Foundation - A future for orangutans, forests and people. Dull and grey, those are the two main words used to describe the cities of the world today. My home is a forest, well it is to me, but to everyone else it’s a colossal, unoxygenated, city of grey. Why they cut down trees I don’t know, probably money. Why is money “so” important to people? I really don’t know? It’s stupid that money is so important to the world, it’s not important, you don’t “need” it to live life happily, all you need is friends and family. Before they cut it down, the forest was happy and lively. My line of family had lived there for generations and by living off the land they all had happy lives, and I did too until the loggers came…they made me and my friends and family leave the forest and everything I knew and loved. What happened then I can’t and don’t want to remember, but the one thing that I do remember is that before I left the forest, curse those loggers, I filled a duffle bag full of acorns, just in case. Turns out I did need them. When I came back to where I came from, it looked exactly the opposite of how I remember. It was dull and grey, and the only animals were depressed, grey pets, rats and flies, the people were the same as the pets, depressed and grey. I hated it, the city and the people, but worst of all was the grey. I had to do something then I found it, the duffle bag. Of course, I can plant trees, shrubs and flowers all over the city and maybe, just maybe, all over the world! I started with my street, planting in every crack in the pavement, in gardens and balconies. Bit by bit, the city began to be more colourful and more importantly, the people were starting to talk and laugh together and be happy. At last my home was happy and lively again. I moved on to another city and did the same and another and another and do on until all the cities of the world were the same as the first one, happy and colourful. We bring you great news from Danau Burung, our guard post in the south-west of the Lamandau Wildlife Reserve! This area was badly affected by forest fires this summer, intentionally started by local inhabitants. In this area people started fires in the forest to quickly clear land of trees in order to encourage grass to grow, to attract deer and pigs for hunting. Fire is also used to clear land for "slash and burn" agriculture, in order to render it useful for farming. These forest fires caused widespread devastation throughout much of Kalimantan in 2015 following a lengthy dry season, causing them to burn out of control. Thanks to two grants, from GRASP (Great Apes Survival Partnership) and Orang-utans in Not e.V (Orangutans in Peril, a German NGO) we were able to invest in a forest restoration project to enrich areas that suffered during the fires in 2015. Ubar trees (Syzigyum spp.) were chosen primarily to replenish the area. This is an endemic species to Kalimantan, which grows well in all forest types, and is less susceptible to burning than other species. The leaves and fruit are also a treat for orangutans! 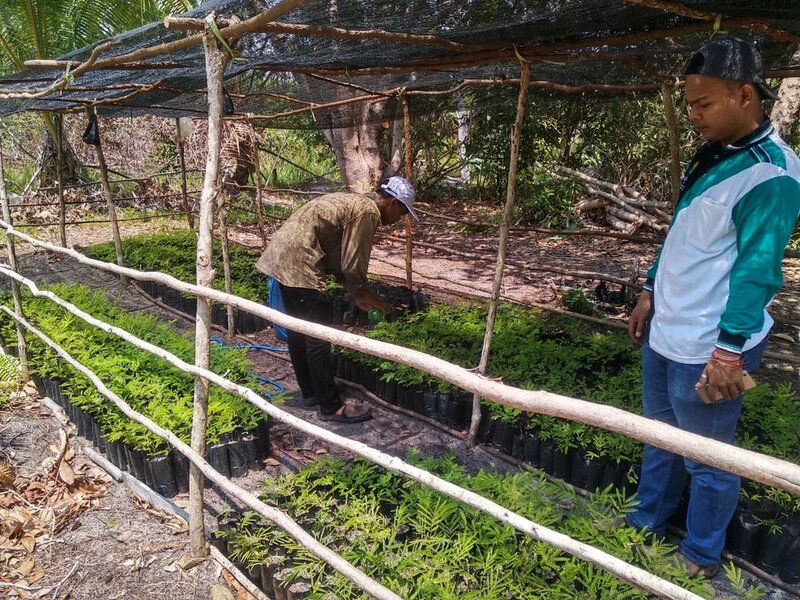 Our partners from BKSDA (Nature Conservation Agency, Indonesia) have provided us with a tree nursery, which our staff are using to plant and grow seeds into seedlings, which are then relocated to areas around Danau Burung. Our Orangutan Foundation staff have now planted 1,500 seedlings in the area to restore the now barren areas of land. 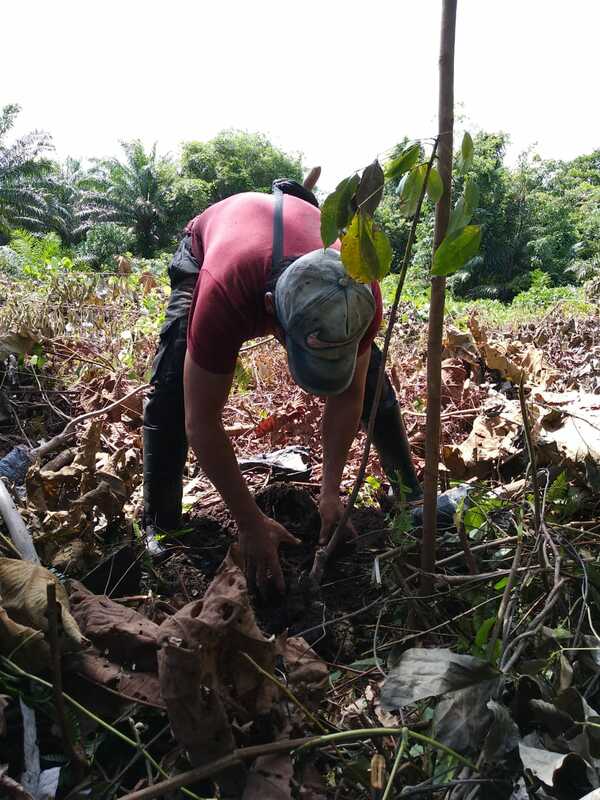 Our target is to plant 5,000 seedlings in the Danau Burung area, and with this news we can successfully acknowledge that we are a third of the way towards reaching our goal! Forest restoration is paramount to the long-term survival of orangutans. If forest habitats are lost, orangutans cannot feed or protect themselves, and populations will perish as a result. To DONATE towards our forest restoration project, quote "FOREST" with your donation! All contributions are greatly appreciated! Togu Simorangkir, director of Yayorin (Yayasan Orangutan Indonesia), our local partners, sent through some photo’s of their Orangutan Awareness Week activities. Yayorin's theme for Orangutan Awareness Week 2009 is ‘Planting trees for the future’. They are targeting villages surrounding areas of orangutan habitat. Their school campaign involves presentations, mobile library, film show, quiz and games. At the community level they have organised an exhibition, puppet show and film show. On Sunday 15 November, Yayorin we will be planting trees in Tanjung Putri village and in the Lamandau River Wildlife Reserve buffer zone. In total about 1500 trees will be planted by students and communities. Yayorin will also be promoting “cheap in your own land” - a campaign to change the slash and burn agriculture method to sustainable permanent agriculture. Yayorin's Orangutan Awareness Week 2009 badge 'planting trees for the future', which they produce and give away for free. We'll post about what we've been up to in the UK tomorrow, Orange for Orangutan Day - go on, go orange and support our work, it's not too late! I hope the orangutans appreciate it! In the past two weeks, I have gone from Pangkalan Bun to Jakarta and back, Sukamara and back, and finally to Sebangau National Park and back; the last journey involving a cramped 10 hour overnight bus ride. In all that time, while I have seen their nests, I did not once lay eyes on a wild orangutan :-( This is an extraordinary amount of travelling, particularly so late in the year which is usually our quiet time. The meetings in Jakarta concerned the potential for protecting forests through the carbon markets, a process know as “Reducing Emissions from Deforestation and Forest Degradation” or REDD. REDD as a conservation tool is in its infancy though many groups are exploring how it could be applied in Indonesia. Multi-stakeholder meeting with communities surrounding the Lamandau Reserve. We went to Sukamara for a “Multi-stakeholders Meeting” when we bring together representatives from all the communities surrounding the Lamandau Wildlife Reserve as well as the local Government. The two-day meeting was a great success, helping us set our plans and targets for next year. Truly, we are receiving an incredible amount of support from the local Government. The trip to Sebangau was arguably the most interesting, not least because I had never been there before. Sebangau was only designated a National Park in 2004 and yet is home to arguably the largest population of orangutans in any national park. Estimates consistently show a population of over 6,000 orangutans. Our reforestation team and I travelled there to see the land rehabilitation research being undertaken by the Centre for International Co-operation in Management of Tropical Peatlands (CIMTROP). Research into peat swamp rehabilitation. CIMTROP's is a pure research project, experimenting with different techniques, habitat types and tree-species to find what works best in degraded swamps. Our work is rather more applied – we want to cover a much larger area than the research project does but there is no sense in reinventing the wheel, or worse, repeating mistakes already made, so it was a valuable visit. Interestingly, at the edge of the CIMTROP study area a team of Japanese scientists have erected an environmental monitoring tower which is some 40m high. I have always wanted to have an observation tower in Lamandau. Having climbed to the top you had to conclude the view was great. The climb. Not one for the faint-hearted! Orangutan Foundation's Reforestation Team looking a little tense on top of the tower! Isam, our Land Manager who had never been anywhere near as high in his whole life, was finally persuaded to let go of the hand rail. Once on the ground though he did agree the climb was an adventure worth having. Thank you Patrik W, Lucia C, Mia B and Wanda H for your recent donations. We really appreciate your support. We are now only $205 short from reaching our $5,000 target – please help us reach this by the end of November. My every sense says the forests on the northern border of the Lamandau Wildlife Reserve are in trouble. Already split into thin fingers of forest, separated by degraded areas, it seems these forests are retreating not expanding. However, with the support of local communities, we have chosen this area as a reforestation site. A few days ago I went there with Rene Dommain, the visiting German peat researcher, and we stayed at the very northern point of the Reserve, where we have a guard post, Post Prapat (see map). Behind the post is one of the fingers of forest. Here there are tall trees, including those species found in deep forest, but they are only 20 metres away from sand. Clearly this is remnant primary forest and the thinner it gets, the more vulnerable it becomes. Aerial view of Post Prapat with the remnant forest behind. Rene helped to explain the process and no surprises here – the villain was fire. Whilst he described it as an “anthropogenic impact”, you and I can hear “man made”. The southern part of Borneo is a relatively “young” landscape. The base material is sand, deposited either from erosion of the high interior mountains or during the periods when the area was an ancestral seabed. Over thousands of years, grasses, shrubs, and then trees gradually covered the sand and forests grew. Fires have had a major impact on this ecosystem. The first fires burning through the shallow humus layer, killing the trees’ roots. With the trees fallen the next fires to occur were even more destructive with subsequent fires encouraging scrub growth. Ultimately this left an exposed layer of sand with the original nutrient rich humus having been destroyed. Presently, these remaining forests are just waiting for the next dry year, the next fire. The aim of the reforestation programme is not ambitious – even in our wildest dreams we cannot envisage the day when this will be thick forest. What we are trying to do is broaden the forested fingers, reduce the gaps and push the balance in favour of the trees not the scrub. It is a tall order to regenerate this area, but you know us, we like a challenge! We have established a tree nursery at Post Prapat. The people from the surrounding communities have been enthusiastic in finding wildings (seedlings harvested from wild seed-fall) to stock it. We will keep the trees in the nursery until their rooting systems are well established. People learn about how fragile these ecosystems are. In the case of Lamandau, the forest core is still rich in biodiversity. I led Rene on the 7 km walk southwards from Post Prapat to Camp Rasak. On the way, we saw a few birds and a snake. At Camp Rasak, I was hoping to catch of glimpse of Boni who we are told is seen most days and neither did we see Andi and Sawit, who seem to have gone off together (see post 'More orangutans back in the wild'). However we were fortunate to see Lady Di and her baby. Lady Di was released into Lamandau in Febuary 2006 and this is her first baby. It is hard to believe our reforestation programme site is only 7 km away, but without this added protection, this forest and these orangutans would seem a lot more vulnerable. We are participating in WildlifeDirect's business strategy. Please help us by taking this user survey, thank you.